Anyone who says they expected Brock Osweiler to lead the Miami Dolphins to a victory against the Chicago Bears in NFL Week 6 is either a time traveler or a liar. Yet, the improbable occurred. It was just one of the unexpected developments that highlighted a full slate of games this weekend. We’ll go ahead and start with Osweiler’s huge game as we look at the biggest winners and losers from the action this week around the NFL. No defense in the NFL has been more terrifying for opposing quarterbacks to face this year than the one featured in Chicago. So, when it was announced Sunday morning that Ryan Tannehill wouldn’t play, and that Brock Osweiler would start instead, most assumed the worst. Osweiler had other ideas. Though he did suffer through a classic Osweilian stretch in which he threw two interceptions, the backup quarterback was otherwise tremendous. He ended up going off for 380 yards and three touchdowns through the air (granted, plenty of that came on two passes to Albert Wilson). Better yet, the Fins actually won. Watching Eli Manning decline the past few years has been akin to watching a slow-motion train wreck. The two-time Super Bowl champion has been awful overall this season, and on Thursday night he gave the New York Giants no chance against the Philadelphia Eagles. Playing behind a flat-out bad offensive line, Manning is a statue in the pocket. He was sacked four times and hit a grand total of 13 times. He completed just 24-of-43 passes in the game, which is bad enough. But when you take Saquon Barkley out of the equation it gets even worse: 15-of-31 passes completed for a total of 182 yards. Manning also threw a godawful interception and failed to throw a single touchdown. He’s just not good, and the Giants are now 1-5 on the season with no hope in sight. In an era when passing stats are more inflated than ever, Minnesota Vikings receiver Adam Thielen is setting a new bar for excellence. On Sunday, Thielen caught 11 passes for 123 yards and a touchdown. That’s huge, all by itself. However, it also marked the sixth straight game in which Thielen has gained at least 100 yards through the air — a Super Bowl-era record to start a season. On the season, Thielen has now caught 58 passes (most in the first six games in NFL history) for 712 yards and four touchdowns. He’s on pace to catch 154 passes for 1,898 yards and 10 touchdowns. Whew. Once again, Blake Bortles had an awful game on the road Sunday as the Jacksonville Jaguars lost their third game of the season. Yet we can’t pin the 40-7 blowout loss on Bortles, despite him being the easy mark. Jacksonville’s defense was pretty much useless. Dallas did whatever it wanted to do offensively, racking up 378 total yards, 23 first downs and averaging 5.2 yards per play. Even more remarkable, the Cowboys didn’t turn the ball over once, and at halftime, they had more first downs than the Jaguars had total plays. Dallas controlled the clock, and it controlled the tempo of the game from start to finish. The ‘Boys dictated how this game went, and the Jags were always well behind reacting to it all. Just an awful, awful performance by a team many have picked to represent the AFC in Super Bowl LIII. Melvin Gordon came into Week 6 with six touchdowns already, thanks in part to a three-touchdown outburst against Buffalo earlier this season. He matched that total in Sunday’s game against the Cleveland Browns. Gordon had a spectacular overall game. He rushed for 132 yards on just 18 carries and added two catches for 18 yards. His three touchdowns were key in a game that saw Philip Rivers struggle somewhat in the passing game, aside from a few huge plays. Now through six games, Gordon has 745 yards and nine touchdowns from scrimmage. That’ll get it done. Josh Allen was far from magnificent on Sunday on the road against the Houston Texans. However, when he exited with an injury to his throwing arm, backup Nathan Peterman reminded us why the rookie is in there to begin with. Peterman did manage to throw a touchdown in the fourth quarter that gave Buffalo the lead. A few drives later, however, after the Texans tied things up with a field goal, Peterman went full Peterman on us and threw a ghastly pick-six. On the next drive, still with a chance to tie or win the game late, he threw another one, which was equally as horrible. Game over. And Bills fans have to be praying Allen is okay for next weekend, because Peterman is just unthinkably bad. One of the games we highlighted as an upset special turned out to be just that. The Cincinnati Bengals, in full control of the AFC North before Week 6, were favored to win by a field goal but ultimately fell by a touchdown. It’s impossible to pinpoint one player as the key to this big win for the Steelers, who are now just one-half game behind Cincinnati for the divisional lead. James Conner was stellar once again, racking up 129 yards and two touchdowns from scrimmage. Big Ben Roethlisberger piled up 369 yards and didn’t turn the ball over. JuJu Smith-Schuster hauled in seven passes for 111 yards, including this incredible one-handed nab that led to a touchdown. And in the end, when the Steelers needed a big play the most, Antonio Brown came through with the game-winning touchdown, the only touchdown throw of the contest for Pittsburgh. In a game that was decided by six points, two glaring mistakes stand out as particularly costly for the Carolina Panthers. Both of them were committed by promising rookie receiver D.J. Moore. The first occurred in the first quarter. Moore went back to receive a punt. Then he fumbled, setting up an Alex Smith touchdown pass the very next play. The second occurred in the second quarter. Moore caught a pass from Cam Newton and fumbled it away after gaining 17 yards. That turnover led to three points as the Washington Redskins finished off a 10-play drive with a field goal. These two turnovers were key to Washington opening up a 17-0 lead, which Carolina was never able to overcome. There’s been a heck of a lot written about how poorly Dak Prescott has played this year. And rightly so. He has earned all that negative press. On Sunday, going up against one of the best defenses the NFL has to offer, Prescott shredded that narrative (at least for a week) with one of his best games in a long time. The third-year quarterback was highly effective through the air and on the ground. He completed 17-of-27 passes for 183 yards with two touchdowns and no interceptions and ran for 82 yards and a score. Again, the most-impressive aspect of all this is he did it against the Jaguars. In the process, Prescott helped the Cowboys improve to 3-3 on the season, which keeps them very much in the thick of things in the NFC East. It’s only been six games, but after the Houston Texans gave up seven sacks to the Buffalo Bills on Sunday Deshaun Watson has already been sacked an astonishing 25 times this year. This keeps up and he’s looking at 66 sacks this season, if he can stay on the field. The second-year quarterback took a total of 12 hits in Sunday’s big win that had more to do with Houston’s defense and Nathan Peterman than anything else. He was already injured heading into Week 6 (ribs) and had to seek medical attention once again in this game. It’s a shame, because Watson is a special talent who’s already made a ton of NFL history in his early career. If the Texans continue to fail him going forward, chances are he’ll never be able to live up to his vast potential. During Atlanta’s recent three-game losing skid, Matt Ryan has actually played at an MVP level. During those three games, he averaged 359 yards through the air and threw nine touchdowns without a single interception. On Sunday against the Tampa Bay Buccaneers, Ryan once again put on an aerial clinic. He completed 31-of-41 passes for 354 yards with three touchdowns and no interceptions. He spread the ball around to eight different receivers and connected 10 times with Julio Jones, who had 143 yards. Even better, his Falcons pulled out a narrow victory against the Bucs, improving to 2-4 on the season. Before diving into the sad state of affairs in Arizona, there’s a silver lining worth pointing out. Rookies Josh Rosen and Christian Kirk are developing nice chemistry. They connected six times for 77 yards on Sunday as the Minnesota Vikings trounced the Arizona Cardinals. Other than that, however, the Cardinals continued to struggle putting points on the board and moving the chains, converting none of their third-down attempts. Coming into Sunday’s game, they averaged 13 points per contest. They did a bit better on Sunday, but it’s important to note that one of the team’s two touchdowns came on defense. Additionally, the fact that David Johnson continues to underwhelm is frustrating. Sunday didn’t feature Jared Goff at his finest. He completed just half his passes, threw an interception and was sacked five times. While Goff struggled, however, Gurley took the game over and helped the Los Angeles Rams stay perfect on the season. Last year’s Offensive Player of the Year is well on his way toward winning that award for a second straight year. He absolutely shredded Denver’s defense on Sunday, rushing for 208 yards and two touchdowns while adding two receptions for 17 yards. 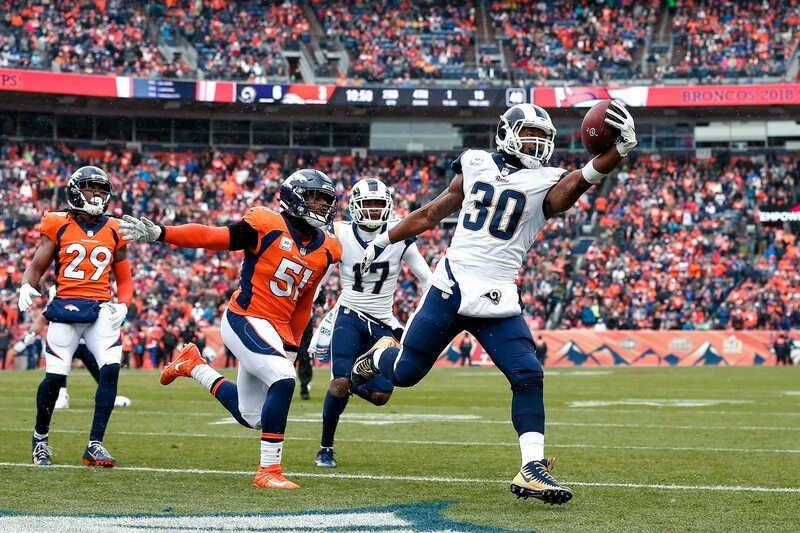 Whenever the Rams needed to move the ball, Gurley came through. Through six games, the former Georgia star has 870 yards and 11 touchdowns from scrimmage. Okay, sure. Jameis Winston threw four touchdowns on Sunday in Atlanta, nearly leading his team to a victory in the end. That’s great. Unfortunately, Winston also was very Winston-like when it comes to ball security. He threw two interceptions in the red zone, which killed to potential scoring drives in a game that was decided by five points. He also fumbled twice but got lucky as his team recovered them both. Winston has all the talent in the world. That’s never been his issue. But his inability to take care of the football is a problem that isn’t going away. Washington gutted out a huge 23-17 win at home against Carolina Sunday, and the stars of the game all had one thing in common. They were all at least 30 years of age. Josh Norman rebounded nicely from an atrocious game on Monday night. He picked off Cam Newton and forced the second of D.J. Moore’s fumbles. Adrian Peterson ran for 97 yards against a very tough Carolina front. Alex Smith was characteristically careful and threw two touchdowns without a turnover. And Vernon Davis hauled in one of those touchdowns, which got the scoring started in the first quarter. Sunday’s loss at home to the Chargers was ugly. Baker Mayfield wasn’t sharp, and it would be fair to criticize him to a certain degree. He completed just 22-of-46 passes, after all, and threw two interceptions. That being said, the young man was under constant pressure, enduring five sacks and nine hits in the game. Even worse, oftentimes when he did get rid of the ball, his receivers dropped passes that were on the money. By my count, the Browns dropped three sure touchdowns in the game, with Antonio Callaway dropping two of them. So, while Mayfield’s numbers were ugly indeed, much of the blame can rest squarely on the shoulders of his receivers and offensive line. For the second weekend in a row, the New York Jets put up a ton of points and won big at home. The past two games against Denver and Indianapolis, the Jets have scored a combined 76 points. Not bad for a team being led by a 21-year-old rookie quarterback. Sam Darnold was pretty darn good Sunday, completing 24-of-30 passes for 280 yards with two touchdowns. The ground game was persistent and kept the Colts’ defense from keying in on the pass rush. But the real star of the show was New York’s defense, which racked up four turnovers, including a pick-six to open the game. What it all means is that the Jets are suddenly a .500 ball club. Which is pretty darn significant considering the low expectations associated with this team and its rookie quarterback. Just when we thought the Oakland Raiders couldn’t sink any lower, they did. The offense as a whole gained 185 yards. Only three points were scored. Oakland’s Swiss cheese defense made another appearance, allowing three too-easy touchdowns while getting to Russell Wilson just once (it’s so hard to find pass rushers, you know). Derek Carr was absolutely abused by Seattle’s defensive line (and appeared to cry on the field at one point), and the Raiders made Seattle’s defense look like the championship-era Legion of Boom. If this isn’t the bottom, it’s darn close. On a night when the Giants were completely blown out, there wasn’t much to celebrate for the hometown fans. However, a silver lining does exist, as rookie running back Saquon Barkley’s remarkable first pro campaign continued with a memorable performance on Thursday night. Barkley carried the ball 13 times for 130 yards and a touchdown, and one particular nine-yard run in the first half was one of the sweetest things you’ll ever witness on a football field. He also caught nine passes for 99 yards, putting up a jaw-dropping 229 yards from scrimmage. Despite all the negative stuff going on for Big Blue, Barkley makes the Giants must-see TV every week. Loser: Titans gave up how many sacks? This is just unfathomable. Seriously. I watched it happen and still cannot believe my own eyes. The Tennessee Titans were shutout Sunday by the Baltimore Ravens, who sacked Marcus Mariota an astonishing 11 times. It’s not like the Titans were out there with scrubs, either. Starting left tackle Taylor Lewan was in there. So was starting right tackle Jack Conklin. Mariota is having a rough enough season all by himself. What he endured on Sunday isn’t going to help him in the confidence department, that’s for sure. It also won’t help the bottom line, as the Titans are suddenly 3-3 after dropping two straight to Buffalo and Baltimore, scoring a total of 12 points along the way. The game between the Kansas City Chiefs and New England Patriots on Sunday night was a fun way to end the day’s action. Both teams put on a show, and Patrick Mahomes brought his team back from a 24-9 halftime deficit with an incredible second half. But when it came time to push all the chips into the middle of the pot, Tom Brady not surprisingly came out on top. First he sold out on a scramble up the middle for the go-ahead score with five minutes left in the fourth quarter. Then after Mahomes and Tyreek Hill stunned Gillette Stadium with a 75-yard touchdown, he led the Patriots on a game-winning drive that culminated with a field goal as time expired.